Did I really buy 8 Mahalo Ukuleles? Yup. Did I get a discount? Nope. 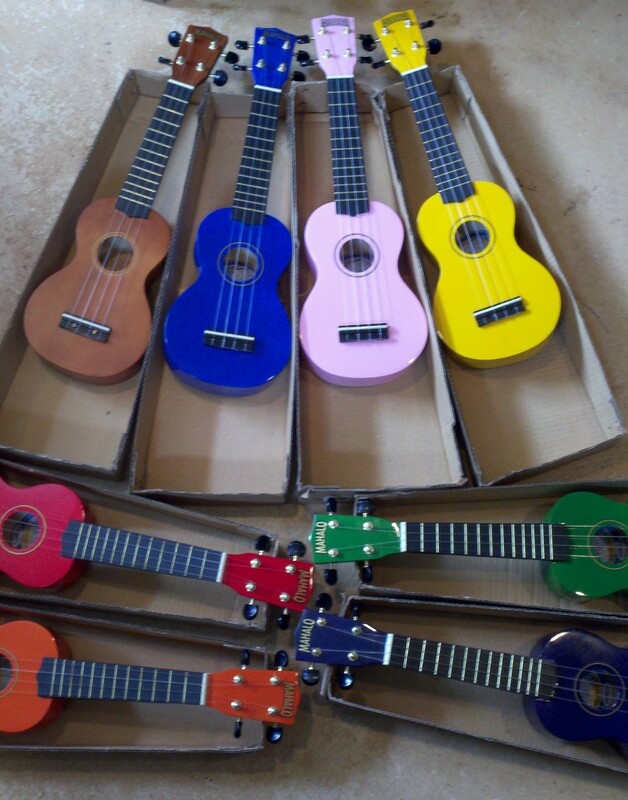 Are all of these Ukuleles for me? Sadly, nope. I'm teaching a ukulele class for the kid's of our local Flagship program. I asked them how many ukuleles they had and I think they only have like 2-3 to work with but there are going to be like 13 kids or something? So, scrounging together my own ukuleles, I realized that I needed to buy some more. That's what led me to 8 shiny new Mahalo ukuleles on my office floor. I'm going to be donating these to the flagship program in the hopes that they can use them over and over again. And, I'm going to have to admit, I'm going to be sad to see these little babies go. They've been making me smile all dang day. My plan for the kids is to show them a few chords and talk about having fun with music and then teach them Big Rock Candy Mountain and/or Yoshimi Battles the Pink Robots, by the Flaming Lips. Hopefully we can get through both. I really wanted to tackle Livin' Thing by ELO, but there are a fair amount of tricky chords in there. And he said, "Boys, I'm not a-turning. The Big Rock [G7]Candy [C]Mountains. In the [G7]Big Rock Candy [C]Mountains. And your [F]parents clean your [C]room.